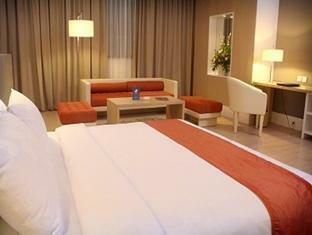 The Grand Jatra Balikpapan Hotel is perfectly located for both business and leisure guests to Balikpapan. The Grand Jatra Balikpapan Hotel boasts a convenient location with modern amenities in every guestroom and superb service. The guestrooms are equipped with non smoking rooms, air conditioning, bathrobes, daily newspaper, desk. Hotel facilities offered at this Balikpapan accommodation include 24hr room service, bar/pub, laundry service/dry cleaning, restaurant, hotel/airport transfer, concierge. This hotel is characterized by a combination of modern comfort and traditional element of Balikpapan, making it a distinct accommodation. For your reservation at the Grand Jatra Balikpapan Hotel Balikpapan, please choose your period of stay and fill out our secure online booking form.